This upgrade has forever changed the landscape, and will no doubt become a recognizable landmark. Overhead view of the completed Mt Edgecombe Interchange. Five years after the first pile was driven into the ground for major upgrading, the iconic Mount Edgecombe Interchange was officially opened by Minister of Transport Blade Nzimande, a fitting end to the 2018 October Transport Month. He described the interchange as “a veritable civil engineering work of art” and said it was a fine example of infrastructure development that has multifarious spin-offs: it contributes greatly to easing traffic congestion, promotes road safety and is also a significant business enabler. “Today’s ceremony comes between the stimulating announcement last Friday of the promised inflow of investments totalling R290-billion that will jump-start the economy, and the drawing to a close of October Transport Month 2018, which has showcased the country’s transport infrastructure development and services,” he said. The South African National Roads Agency (SOC) Limited (SANRAL) awarded the contract for upgrading of the intersection of the N2 and M41 to ease chronic congestion. SANRAL CEO Skhumbuzo Macozoma said the R1,1-billion interchange, which is one of the largest projects undertaken by SANRAL in KwaZulu-Natal, is more than a masterpiece of award-winning architecture – it is a vital artery of the greater eThekwini metropolitan highway system and has greatly contributed to SMME development. He said: “Due to the expansion of the uMhlanga and La Lucia Ridge areas, the existing interchange had been operating at capacity with vehicles backing up on the M41 and onto the N2 in peak hours. “An additional 40 000 vehicles were entering or leaving the N2 from the M41 daily resulting in substantial queuing of vehicles during the day. This upgrade has forever changed the landscape, and will no doubt become a recognisable landmark. The new four-level interchange facility provides at least two lanes on each of the major movements. The upgrade includes the implementation of directional ramps, eliminating the need for controlled signalisation, thus ensuring free flow of traffic in all directions. The construction was jointly funded by SANRAL and KwaZulu-Natal Department of Transport and was undertaken by the South African branch of Italian construction company CMC di Ravenna. Two incrementally launched bridges are part of the interchange upgrade. One bridge, which is 948m long – the longest incrementally launched bridge in South Africa – joins the Mt Edgecombe side of the M41 with the N2 South. The other bridge is 440m long and joins the uMhlanga side of the M41 with the N2 North. The 948m bridge has 23 piers and two abutments and was built from two ends – one portion launched on a curve and the other on a straight. To provide for the safety of pedestrians, a pedestrian bridge has been constructed over the N2 and will connect to new footways. In addition, lighting has been installed to ensure the whole interchange is lit at night for increased safety. The multiple engineering achievements behind this mammoth project are testimony to the exceptional skill and abilities of the entire construction team. The project engaged 80 designers at the peak of the design phase. Not a single road was closed permanently during construction. The improvement of roads has knock-on effects – it helps to develop SMMEs and create jobs. 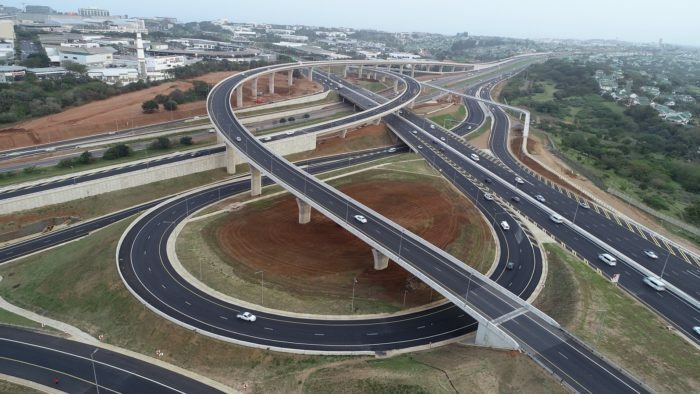 The maximum number of persons employed at a time by the Mt Edgecombe Interchange contractor and sub-contractors was 803 of which 724 were from the eThekwini target area, with a total of R240-million spent on wages to date. A total of 31 sub-contractors have been employed with work to the value of R59-million performed by 21 SMMEs to date. Resident engineer Henk Kaal said although there was a lot of skepticism about the completion date of the project, motorists are now beginning to smile as they start enjoying the improved flow of traffic.